Veterans: Are you Tired of Having Your VA Disability Questions Go Unanswered? After returning home from service, you thought that the worst was behind you. You could come home and live a normal life with your family—at least, as normal as possible—and you could get the treatment you need to cope with your injury. But in the months that have passed, you don’t feel as if you’ve gotten any better. You’re having trouble sleeping and you cannot perform civilian work. What are you supposed to do? If you suffered an injury during service, you could be eligible for compensation through the U.S. Department of Veterans Affairs (VA). If you are approved, you could get monthly payments based on your injuries, medical care, rehabilitation, and prescriptions. Our accredited VA Disability lawyers can help you get that approval. 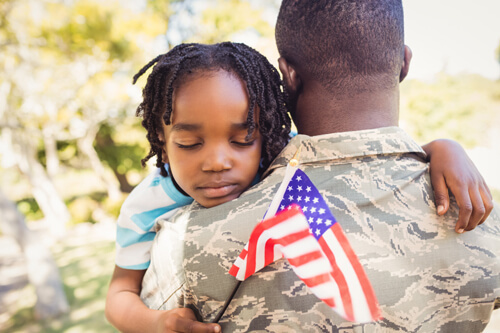 Service: VA compensation benefits are available to any veteran of any branch of the United States Armed Forces who is currently suffering from a disease or a disability caused during service. Qualifications: Veterans must have a currently diagnosed disease or disability that is directly connected to their military service. In most cases, a veteran must show an event during his or her active service that caused the injury, as well as a proven connection between the incident and the resulting disability. Percentage: If you are approved for disability benefits, the VA will determine how much you are eligible to receive each month. The VA will assign you a disability rating from 10 to 100%. The higher your rating, the more compensation you will receive. The appeal process for VA benefits is at best time-consuming, and at worst, a nightmare. If you are a Veteran you may already know how difficult it is to get help with a compensation claim. While your local service officer may help file your application; however, if you are denied they have hundreds of files and your appeal may not get the attention it needs and you deserve. If you need an expert vocational or expert medical opinion to win your case will a service organization advance the costs? When you hire one of the VA accredited attorneys at Cuddigan Law, you have an attorney who is not only available to assist you with the paperwork but more importantly will analyze how VA law and regulations apply to your particular case. We will review your claim file, gather any missing evidence and prepare legal arguments necessary to be successful, not just fill out your paperwork. You do not have to explain the details of your case several times over, you can have your attorney take the steps necessary to develop your claim and he can check into the status of your claims at regular intervals to keep you informed throughout the process. The best way to get the disability compensation you’re entitled to contact accredited Veterans disability attorney Sean Cuddigan with the facts of your case. Contact us at (402) 933-5405 or email us today at [email protected] to get started.